My mission to try out all the food in Emporium continues with Charlie & Co today. I opted for the Classic Charlie Burger, which was pretty disappointing. The beef pattie was very tough, and the bun itself was slightly burnt, and very dry. I did like the brie on top of the burger though, but it was just not enough to save the burger. The Parmesan and Truffle Fries on the other hand, was amazing. I first had truffle fries back in Singapore, where it’s a thing I think. You could smell the truffle straight away, and that’s always a good sign. The fries were perfectly crispy outside, fluffy on the inside, and with a little bit of parmesan, truffle oil, and the addition of aioli, every bite was worth clogging your arteries for. I have some mixed feelings about Charlie & Co, the burger was below average, but the fries were there to save the day. I’ll definitely return for the fries, and maybe give their burgers another go? Then again, with the plethora selection of burger places all around the city, I’m not sure if I want to risk being handed a mediocre burger for the second time. 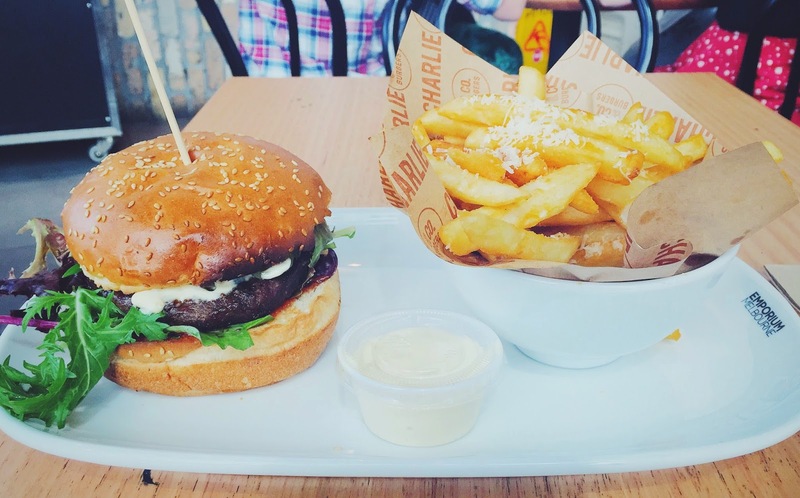 Charlie & Co Burgers is located in Emporium, the Cafe Court on Level 3.